I always strongly caution readers not to read too much into the fluctuations of a single month's comics orders, and the opening of 2011 has shown us why. As I noted early on and in my final report for January 2011, the first month of this year was one of the noisiest months in sales tracking since Marvel returned to Diamond in April 1997. Diamond Comic Distributors' switch to Tuesday shipping reportedly resulted in several publishers missing their windows for many products at the beginning of the year, and the lightest weekly shipments of new products ever seen by several retailers I spoke with. That combined with an artificially larger comparison month in 2010 and the usual "dead quarter" publisher cutbacks to produce a major drop — a drop which February 2011, a more normal month in many respects, has gone a good distance toward erasing, according to figures released this morning by the distributor. Click to see the Top Sellers for the month; estimates will be along next week. Those estimates will likely show the all-time lowest sales for the top-selling issue of the month. 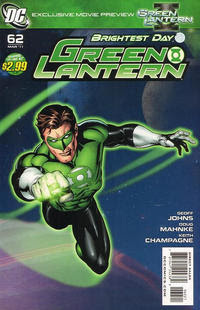 Green Lantern #62, at the new, lower $2.99 price, was the top seller in a month in which DC had six of the top ten comics — and as it's got a similar order-index number to Brightest Day, which was selling in the 70,000s, we could well find it in there too. It could be an alarming number for longtime observers, but note that the lack of a blockbuster didn't make much of a difference to the overall comics periodical numbers, which were only off 2% in units and dollars. Trade paperbacks and graphic novels, with the Batman: The Return of Bruce Wayne Deluxe Edition hardcover leading the way, were up 7% year-over-year, and the overall market was up 1%. The overall figure will likely be just over $30 million. That halves the losses year-to-date; we're now off 10% in overall direct-market sales. Perhaps the most important thing observers will be looking for in the coming months is the effects of DC's price drops. We can see it clearly in the offerings this month: In the Top 100, $2.99 was both the median price and the most common cover price. The average and weighted average in the Top 100 was $3.46, well down from last year's highs. It will likely take a few months to see what impact this has on demand: given that we're still in the slow quarter, it could take longer for the entirety of the consumer base to be exposed to the new prices. The top-sellers lists can be found on the main page for the month. We'll learn more from the specific estimates next week, but it does look like February, with its slight periodical drop and slightly larger trade paperback increase is more typical of the market's previous behavior than January's steep losses. We'll see as the year goes on, of course, which is closer to the overall picture.